The other day I was watching the Bollywood movie Shaandaar. Now, this is not a critique of the movie and I’ll be mentioning minor plot details. The movie itself wasn’t all too emotional, pretty lighthearted, but there was one part where I actually felt myself tearing up. One of the characters, Isha, is overweight and in an arranged marriage with Robin, this body-builder type macho man. Typical Bollywood, I know. The thing is, when Robin starts referring to Isha as not only a laddoo, but an entire sweet store, I started getting just as emotional as Isha overhearing in the back. In those few moments, it was like I was reliving my entire childhood and adulthood. Basically, my life. First let me give some background. I grew up in a culture where “beauty” is defined by two factors: how skinny you are and how light-skinned you are. Seriously, you could look like a horse, but if a size zero dress was loose on you and your skin color was transparent, well weren’t you lucky. I happened to fall on the lighter side of the color spectrum, but I was always described as shastho bhalo. Roughly translated, the phrase means the health is well, or very healthy. Healthy in this case refers to weight. For as long as I can remember, the comments about me ran along the lines of, “She’s very sweet, but she would be so much prettier if she could lose a little weight.” And ever since I was a child, the two adjectives I’d use to describe my appearance were tall and fat. Unfortunately, I never really grew out of that. I should clarify a few things. This is not a post where I take pride in being overweight. There is an extremely strong correlation in being overweight and numerous health problems. As a woman, a high weight carries risk in irregular menstrual cycles, carrying a child, and other hormonal issues. I realize these risks. 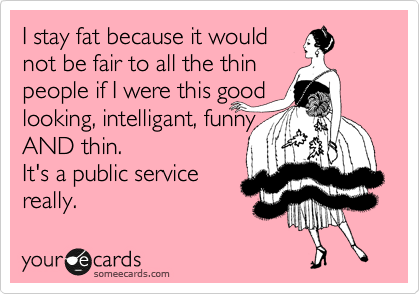 I know that I can’t just say I’m fat and fabulous and then eat a tub of ice cream. This is however a post about the mental state of being overweight. Many times the rhetoric when speaking to overweight people tends to be, “If you want to lose weight, just diet and exercise. It’s easy.” And in this one statement, a number of unsaid statements are laid out. The main assumption in that statement is that if you are overweight, you’re not controlling your diet and you’re not exercising. If we believe that, then we’re saying that someone chooses to be fat, like it’s an active decision. I don’t know about you, but I know I never woke up one morning and thought to myself, Hmmm, I think I’m going to gain so much weight, I outgrow all of my clothes and test the elastic power of my skin. For most people I know, that’s not the way it went. There are several factors in determining how a person gains weight, metabolism being a key factor. When I was a kid, I had no idea what a metabolism was, let alone how to increase or decrease it. All I knew was that it was somehow my fault I was fat. I must be doing something wrong. The reality was probably different. The people around me may have been more positive than I remember. But when you’re eight and you’re being told that the size you wear is bigger than other girls your age, reality gets a little distorted. It especially didn’t help that the other Bangali girls around me fit into the typical mold they were supposed to be, without having to be concerned with diet and exercise. Eventually I went into a state of numbness, filtering out any and all comments having to do with my size. That got me through most of my adolescence. Most, not all. The times I couldn’t filter were when I went into dressing rooms at stores and realized the large sizes were getting smaller, which eventually led into XL sizes getting smaller. It wasn’t until I got older that I realized that the actual dimensions for the clothes were getting smaller; it wasn’t just me growing wider. Again, when you’re 13, reality isn’t really playing a role. There were moments when I did lose weight later in adulthood. You would think this would be a confidence booster, a help to improve my own self-image. The problem I faced when I did lose weight was the reaction from other people. Mainly I’d get legitimate freak outs along the lines of, “OH MY GOD! You lost soooo much weight. What did you do?? ?” I’m sure they were all well-intentioned, but to me that translated into, you were so big, I’m surprised you didn’t have mobility issues. Obviously, these people weren’t aware of all the emotional baggage related to my weight issues. How could they? I wasn’t even fully aware of it. Since I’ve gotten married, I gained the usual after marriage weight. I expected that. What I didn’t expect was developing a thyroid disorder earlier this year. Initially I wasn’t sure what was going on. I was stressed from my job, but I hadn’t realized I could gain so much weight from just stress. I was irritated and tired all the time. Finally the doctors confirmed the cause, medications were started, and a life plan was made. Simple, right? Except for the fact that with all this weight gained, all of those unresolved issues buried deep within came flooding back. With every outfit I outgrew, the tears came streaming. With every weigh in at the doctor’s office, the frustrations grew exponentially. It’s something I’m still dealing with, still learning how to deal with, and hopefully I learn how to deal with it in a healthy way. But it still gets to me when anyone implies that I chose to be in this state. Few people choose to be fat. No one chooses to go through the ridicule of being the big one. Not many people I know of enjoy shopping in the plus size section to see that the clothes were made with little thought to how clothes actually fit. Not any of the other fat people I know are actively sitting on the couch not battling their weight. Because that’s what it is, a battle. A constant struggle stay hungry, to push through the pain, to literally go the extra mile. So the next time you think of dismissing a weight issue, think about what those words actually mean. Think about the weight of those words, who you are speaking to, and all the things you’re not saying by what you’re saying.